Hiking – There are currently 15 interpretive hiking trails to be explored along the park corridor. They range from short and easy (Spruce Bog Boardwalk and the Logging Museum trail are actually wheelchair and stroller accessible!) to much lengthier and more challenging (such as Centennial Ridges, which is 11km long and has a steep incline but rewards your efforts with one of the most phenomenal views of the park). Information on these hiking trails can be found in the park newsletter available on the tea cart in our kitchen or at either of the Park gates. We would also be delighted to sit down with you when you arrive to offer trail tips and answer any questions you might have. Wildlife Viewing & Birding – Algonquin is home to 40 mammal, 30 reptile and amphibian, and 130 breeding bird species. If you are interested in seeing a certain species we’d be happy to discuss their usual habitat with you, and where those habitats might be found. There’s never a guarantee that you’ll see your favourite species but narrowing down where to look can help a lot. The Visitors’ Centre inside the park also keeps tabs on animal sightings. Bicycle Rental – The Lake of Two Rivers store is a 20 minute drive into the park from us. Here you can rent a variety of bikes for adults and children including bike tows for the really wee ones. The best leisure biking paths in the park, which follow the old railway line along streams and lakes, also begin from Lake of Two Rivers. If you’re into more hard-core mountain biking and are bringing your own equipment, the Minising bike trail at kilometre 23 is the one for you. If you’d like to take a bike guide along with you for the day, our friends over at Algonquin Adventure Tours would be happy to host you – they will also arrange your equipment rental. Programs for families – The Friends of Algonquin Park charitable organization, in conjunction with park staff, does a magnificent job creating programming for families all year round, and particularly throughout the summer. Any family coming up for a visit should check out their calendar of scheduled events, including the Wolf Howl on Thursday nights in August and September. Canoe & Kayak Rental – There are lots of opportunities for canoeing and kayaking inside the park, and a couple of different ways to rent the equipment you need. If you want to have complete freedom to select the lakes and rivers you explore you can rent your equipment from the Algonquin Outfitters store at Oxtongue Lake, which is less than a minute down the road from us, and they will help to mount your canoe on top of your vehicle to take into the park yourself. If you would prefer to paddle without the responsibility of taking your equipment with you, rentals can be arranged from the Portage Store at Canoe Lake, which is a 15 minute drive from the Den, and launched from their very own dock. If you’d like to explore the eastern end of the park corridor by boat, canoes and kayaks can be rented from the Algonquin Outfitters store at Opeongo Lake, a 45 minute drive from the Den, and also launched right on site. The Opeongo store also offers tours of the lake by motor boat, and water taxis for you and your canoe if you wish to begin your paddle further up the lake. Neither Algonquin Outfitters nor the Portage store require reservations for canoe rentals of less than a day but be sure to get in touch with them in advance if you want to take the canoe overnight or would like an outfitting package for a multi-day camping trip. 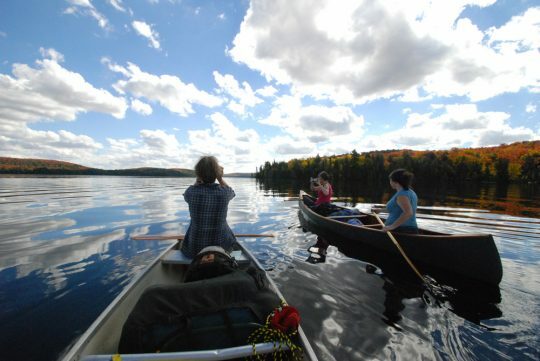 Guided Canoe Day Trip – Algonquin Outfitters and the Portage Store (mentioned above) offer guided trips of various lengths. 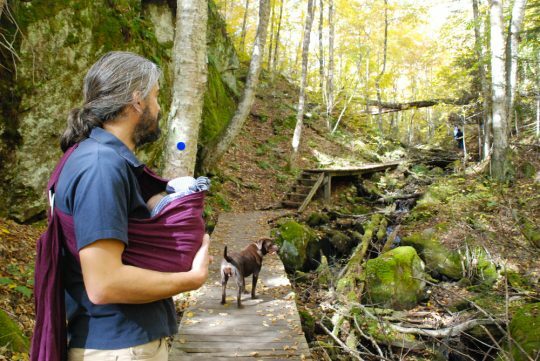 In addition to these options, the crew at Algonquin Adventure Tours are fantastic and would love to introduce you to Algonquin or deepen your understanding of park ecology. All three organizations offer single-day and multi-day guided trips. Please reserve your guide in advance, especially in the busy summer months. Swimming – Inside the park there are a couple of designated beaches for you to enjoy, including East Beach, Canisbay, and Lake of Two Rivers. There are a few hidden gems along the corridor that you can ask us about, too! If you’re using the Wolf Den as a basecamp for your back-country adventures, there are countless pristine lakes to enjoy. The Algonquin Park Visitors’ Centre, Logging Museum, and Art Gallery are three great places to visit in-between your outdoor adventures. Swimming – The Wolf Den has its own perfect swimming spot on the Oxtongue River. Coming straight out of the park, the water is beautifully clean and deep – a pleasure to swim in. As of last summer we also have a dock to leap into the river from or sunbathe on. Paddling the Oxtongue River and Lake – Just a one minute drive from the Wolf Den is the Algonquin Outfitters Oxtongue Lake store where you can rent canoes and kayaks and launch from right off their dock. Meander by canoe along the Oxtongue River back to the Wolf Den and onwards to Ragged Falls (round trip: about 3 hours) or paddle around Oxtongue Lake for the day. You can also rent voyageur canoes (for 10 people) and stand up paddle boards from there. Ragged Falls – a 20 minute hike away to a beautiful waterfall with a short trail along the river. Most guests will spend about 1 hour at the waterfall. You can also paddle there along the Oxtongue River from the Wolf Den’s own doorstep! Gravel/High Falls – this is a much lesser known, but equally dramatic, waterfall accessible from the Wolf Den’s own property, about an hour and a half hike away. Gorgeous. Ask Jennifer or Jacques for specific directions to the trail head before you set out as the trail is very clear, but unmarked. Beetle Lake Trail – Beginning just down the road from us, this 6km hike goes along a high cliff, through hemlock forests, into maple forests, down to a stream and then over to Algonquin Outfitters. TreeTop Trekking – Enjoy a half-day way up in the tree tops, zooming across zip-lines and obstacle courses 50 feet in the air. We’ve done it and loved it. Previous guests who have done it rave about it. (And its an excellent cure for minor vertigo – seriously!). TreeTop Trekking is just twenty minutes from the Den by car, towards Huntsville. Sugar Bush Hill Maple Farm – Every Canadian neighbourhood needs its own Sugar Bush and this is ours. Pay them a visit to find out how maple syrup is made and get your sugar hit for the week. They offer a great afternoon out – in fact, Sugar Bush Hill has been named by Trip Advisor as the #1 place to visit in Muskoka! They’re located just south of Huntsville, about 30 minutes away. Make sure to check their website for tour dates and times before you go. There’s lots to explore in the Park, in the immediate vicinity of the Wolf Den, and in our general region, during that magical time when snow blankets the earth – typically between early December and mid-April. Hiking & Snowshoeing – There are currently 15 interpretive hiking trails to be explored along the park corridor. They range from short and easy (Spruce Bog Boardwalk and the Logging Museum trail are actually wheelchair and stroller accessible!) to much lengthier and more challenging (such as Mizzy Lake or Track & Tower). Information on these hiking trails can be found in the park newsletter available on the tea cart in our kitchen or at either of the Park gates. We would also be delighted to sit down with you when you arrive to offer trail tips and answer any questions you might have. Snowshoes can be rented at fair rates from our neighbours, the Algonquin Outfitters store at Oxtongue Lake. And if you’d like to take along a guide, Algonquin Adventure Tours would be pleased to head out into the bush with you, offering you insights into our gorgeous winter ecosystem and tips on staying warm and comfortable on cold days out. Dog sledding – Our friends at Snow Forest Adventures drive dogsled teams all winter long inside Algonquin Park and would be delighted to take you along. Be sure to book well in advance. Dog sledding typically runs between the last week of December and late March, depending on the snow. It’s an experience not to be missed. Skiing – Groomed cross-country ski trails for a variety of skill levels can be found at Fen Lake (a 5 minute drive from us at the West Gate of the Park) and Leaf Lake (at the other end of the Park corridor, about an hour’s drive from us). There are also lots of skiing opportunities outside the park gates: keep scrolling down the page to read more about those. Skis and other winter equipment can be rented from our neighbours, the Algonquin Outfitters store at Oxtongue Lake. Programs for families – The Friends of Algonquin Park charitable organization, in conjunction with park staff, does a magnificent job creating programming for families all year round. Any family coming up for a visit should check out their calendar of scheduled events. The Algonquin Park Visitors’ Centre, closer to the East Gate, is a great indoor introduction to the park to visit in-between your outdoor adventures. 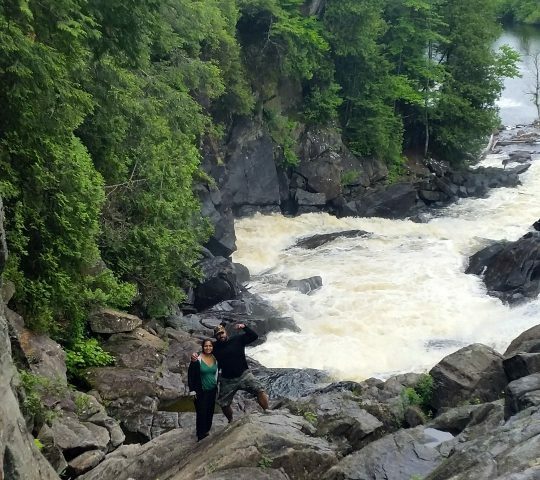 Ragged Falls – a 20 minute hike away to a beautiful waterfall with a short trail along the river. Most guests will spend about 1 hour at the waterfall. Gravel/High Falls – this is a much lesser known, but equally dramatic, waterfall accessible from the Wolf Den’s own property, about an hour and a half hike or snow-shoe away. Gorgeous. Ask Jennifer or Jacques for specific directions to the trail head before you set out as the trail is very clear, but unmarked. Cross-Country Skiing on Groomed Trails – Our wonderful neighbours over at the Blue Spruce Resort welcome guests from other resorts in the area to enjoy their groomed skiing trails. The cost is just $5 per person for the day. Back Country Skiing – Timber Trail Lane, an old logging road, runs north from our property through the northern edge of Ragged Falls Park and ultimately into Algonquin Park itself. In the winter this lane is an absolute pleasure to ski and snowshoe on when conditions are right. Frost Centre – Some of the best cross-country skiing trails in Ontario are at the Frost Centre, just 30 minutes south of us. Sugar Bush Hill Maple Farm – Every Canadian neighbourhood needs its own sugar bush and this is ours. Pay them a visit to find out how maple syrup is made and get your sugar hit for the week. They offer a great afternoon out – in fact, Sugar Bush Hill has been named by Trip Advisor as the #1 place to visit in Muskoka! The farm is located just south of Huntsville, about 30 minutes away from the Den. Make sure to check their website for tour dates and times before you go. 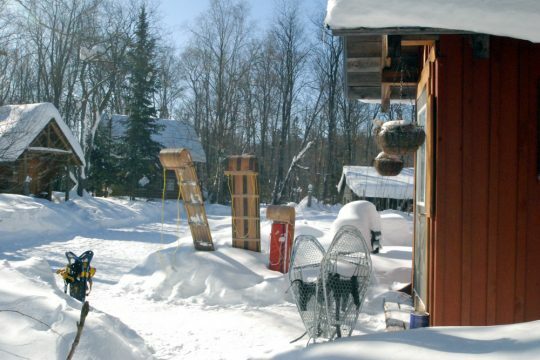 Dog sledding – Two companies in our beautiful home county of Haliburton Highlands offer dog sledding (outside the park, but in equally magical surroundings!). Check out and the Haliburton Forest (where you can also visit a wolf reserve) and Winterdance. Dog sledding typically runs between the last week of December and late March, depending on the snow. A truly Canadian experience. 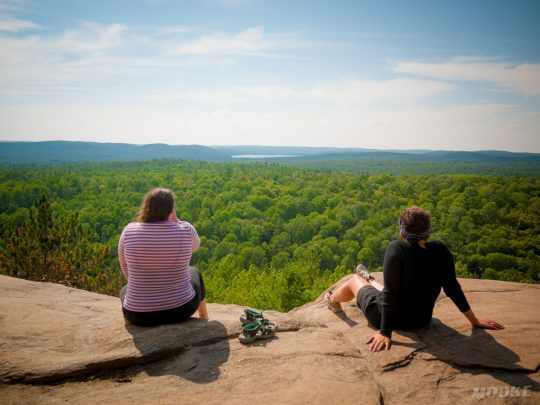 Arrowhead Provincial Park – Arrowhead might be a 45 minute drive away towards Huntsville, but IT’S WORTH IT! In the winter months the park offers cross-country and downhill skiing, and… wait for it… a skating trail that meanders through the woods!